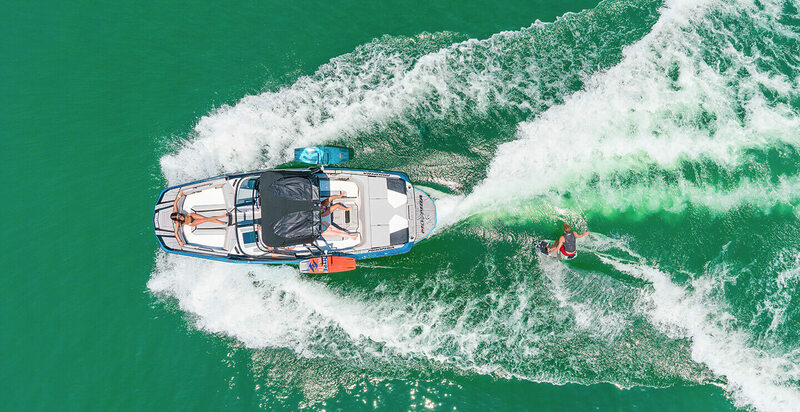 Skier’s Choice, Inc. is the proud manufacturer of Supra® and Moomba® performance inboard wakeboard and waterski towboats. This page is provided to satisfy the virtual patent marking provisions of various jurisdictions including the virtual patent provisions of the America Invents Act codified at 35 U.S.C. § 287(a). The following list of products may not be all inclusive, and other products not listed here may be protected by one or more patents. Moomba® is a federally registered trademark owned by Skier’s Choice, Inc. Skier’s Choice™, the Skier’s Choice logo, the Moomba logo, Helix™, Mondo™, Mojo™, Craz™, Smart Plate™ and AutoWake™ are trademarks owned by Skier’s Choice, Inc. All other trademarks are the property of their respective owners. Supra® is a federally registered trademark owned by Skier’s Choice, Inc. Skier’s Choice™ , the Skier’s Choice logo, the Supra Logo, SR™, SA™, SE™, VISION Touch™, Swell™, Launch™ and AutoWake™ are trademarks owned by Skier’s Choice, Inc. All other trademarks are property of their respective owners. AutoWake™ : U.S. Patent Nos. 8,798,825; 9,689,395; 9,828,075; 9,873,491; 10,093,398 and other patents pending. Flow 3: U.S. Patent Nos. 10,040,522; 10,112,688; 10,202,177; 10,239,591. Amplitude Display: U.S. Patent No. 9,950,771. Skier’s Choice, Inc. reserves the right to change product specification at any time without incurring obligation. © 2018 Skier’s Choice, Inc. All rights reserved. Supra® is a federally registered trademark owned by Skier’s Choice Inc.
SR™ is a trademark owned by Skier’s Choice Inc.
SA™ is a trademark owned by Skier’s Choice Inc.
SE™ is a trademark owned by Skier’s Choice Inc.
Moomba® is a federally registered trademark owned by Skier’s Choice Inc.
Helix™ is a trademark owned by Skier’s Choice Inc.
Mondo™ is a trademark owned by Skier’s Choice Inc.
Craz™ is a trademark owned by Skier’s Choice Inc.
Mojo™ is a registered trademark owned by Skier’s Choice Inc.
AutoWake™ is a trademark owned by Skier’s Choice Inc.
Swell™ is a trademark owned by Skier’s Choice Inc. VISION Touch™ is a trademark owned by Skier’s Choice Inc.
Smart Plate™ is a trademark owned by Skier’s Choice Inc.
Launch™ is a trademark owned by Skier’s Choice Inc.